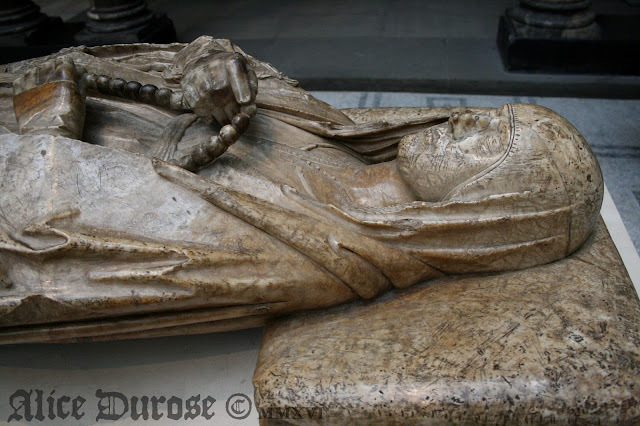 Following a visit to one of my favourite museums; the V&A during a short break in London, I have decided to write a piece looking at the aesthetics and importance surrounding tombs. The V&A is packed with effigies, busts, sarcophagi and tombs. The aesthetic depiction of death is everywhere, but what is its historical and cultural significance? Physical reminders and markers of the dead stretch throughout history, from domed earth mounds bearing the remains of one, or many people, to elaborate tombs and monuments found in virtually every civilisation across the globe. With time, tastes and faith, the way we bury, and physically remember and represent our dead has changed. Certainly in modern day England, personal monuments have largely become (for the most part) unimaginative, uninspired and increasingly unpopular. Something you simply choose out of a catalogue, for your convenience, and pay by the letter to express your dearest sentiments. But across Europe during the Medieval and Renaissance periods things were very different. Like the Romans and Egyptians before them, they felt death mattered. Being remembered, respected and immortalized forever, demonstrated the most important things achieved during your life; your wealth, earthly deeds and ultimately - status. The 'Tomb Effigy' or as the French call it 'Gisant' (meaning recumbent) was a popular expression of this. 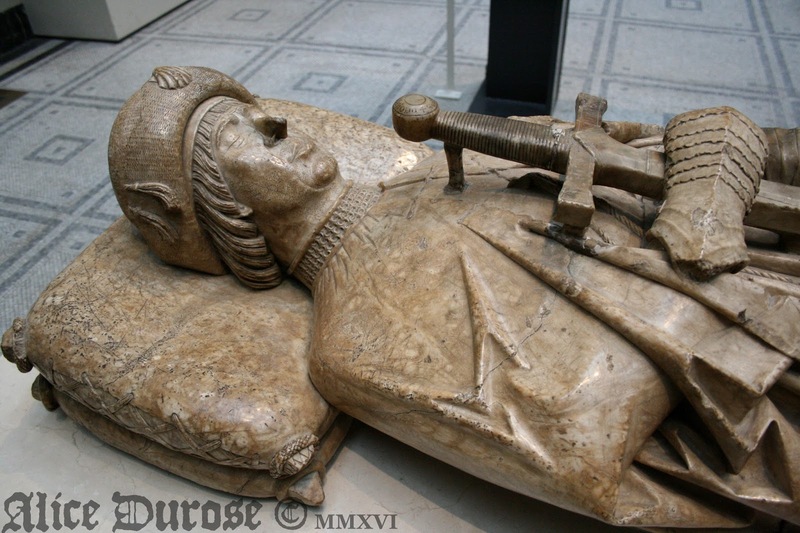 The height of funerary fashion from the 12th century onwards, a tomb effigy was a guaranteed reminder of your physical presence and legacy on the earth, indefinitely. Monarchs from the mightiest kingdoms and empires were immortalised after death, with the most excessive tombs and monuments imaginable. But gisants weren't just reserved for royalty, and they provided the chance for a few to get their slice of immortality. Initially the tomb effigy began life essentially as a low relief or carving decorating the lid of the deceased's casket. As time progressed designs became larger and more elaborate, eventually becoming life size, fully formed reclining sculptures. The gisants became lavish, opulent and excessive, with Queen Elizabeth I's tomb effigy even dressed in magnificent, luxurious clothing. 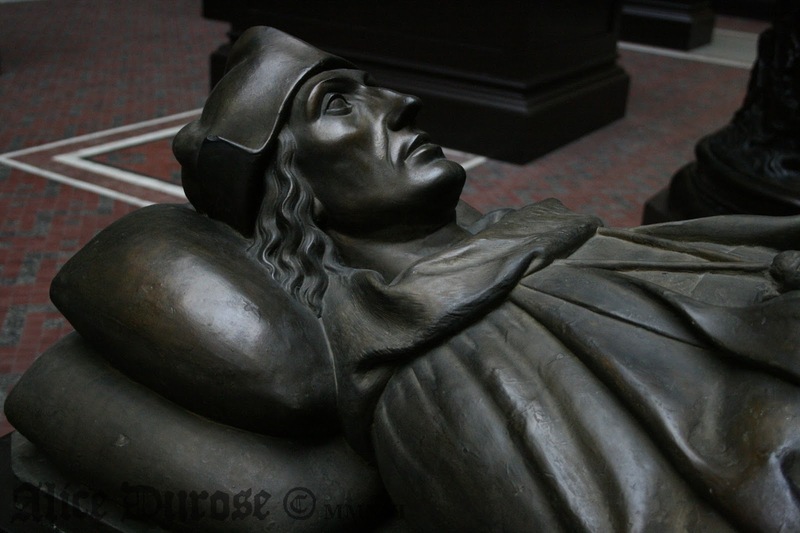 An example of Royal gisants and their unapologetic grandeur is Henry VII's tomb effigy. A plaster reproduction of the original can be seen in the V&A, the main article is on display in its own dedicated chapel in Westminster Abby. The original gilded bronze effigy, which is positioned beside Henry's Queen looks remarkably different to the reproduction. The gilding of the reproduction is tarnished with oxidization, giving it a much more subdued, emotionless look in comparison to the gleaming, lavish original which simply oozes power, wealth and excess. 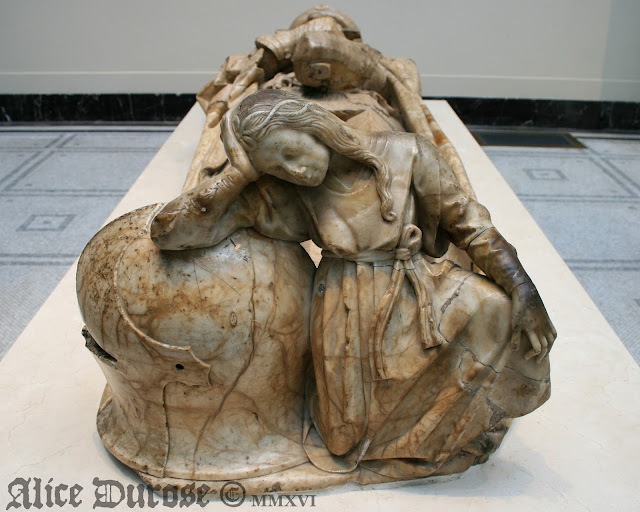 My favourite tomb effigies on display at the V&A were those of husband and wife Don García de Osorio and Doña María de Perea. The effigies originated from 14th century Spain, which is reflected in their religious imagery and the simple, honest aesthetics of the figures. On first glance the female figure appears to be a nun, however she is not, the items such as the rosary beads and her modest dress, symbolise her piety and faith. Her husband was a member of the Order of Santiago, an order of Christian knights who defended pilgrims and the Christian faith. On his chest the symbol of his order can be clearly seen, suggesting his allegiance in life and death. Latin inscriptions upon his sword reading 'Jesus give me victory' and 'The blessing of God' reaffirm the importance of their faith. It is the main focus of their effigies, suggesting that religion was the foundation of their lives. 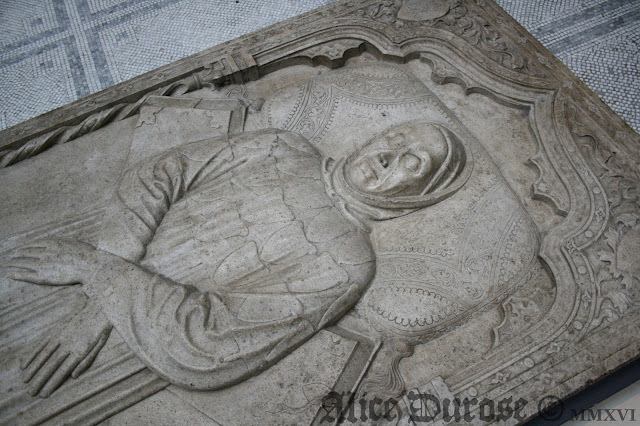 Knelt at the feet of Don García de Osorio is an unidentified woman, a 'mourning figure' became popular feature of tomb effigies as they developed in complexity and detail. 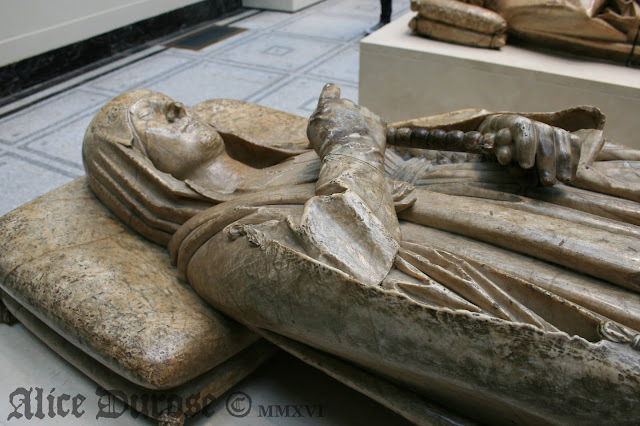 Many mourning figures knelt in prayer for the dead, as an attempt to encourage those who looked upon the tomb to do the same, however the figure mourning the knight is simply supporting the weight of her grief with her hand, with a posture which suggests respect, sorrow and possibly even waiting. These effigies are prime examples of how funerary art was used to convey various elements of peoples lives after their death. Their morals, achievements, status and their legacy have all been captured in stone, immortalising their fleeting earthly existence forever.